Looking for paintball stores in MN that are also a place with a great outdoor atmosphere that provides recreation for your family and friends? 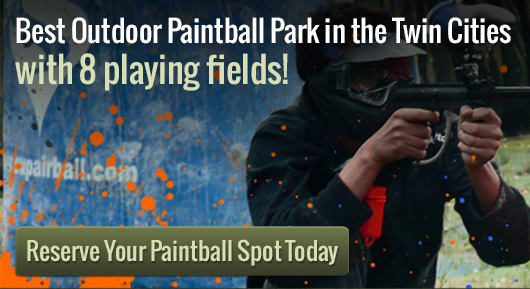 Paintball stores in MN and paintball fields provide the perfect place to plan your party. You will find the proper equipment in several locations in Minneapolis, which make it convenient for people all over the state of Minnesota to enjoy the outdoors. Venues and paintball stores in MN like our Minneapolis, Jordan, and St. Paul locations give the players a variety of places to go to shop and have fun in the great outdoors. Take Tombstone, Minnesota, for example, an old western town, where your base is surrounded by a fast moving speedball, which can actually hit you in the head if you don’t duck. The track here is to conceal your location behind your shelter that protects you from group activity. It’s important and imperative that you have a shelter to protect yourself against oncoming speedballs that may just miss your head. Protection gear may be the perfect answer to your problem, and you, as a player, have a variety of places to go to get prepared; and a variety of venues and wide-open fields. Our paintball fields and paintball stores in MN provide locations for the players with excitement to the point where groups can compete and show off their new-learned and developed skills. Some players like to strive for perfection, others really enjoy the great outdoors, and many enjoy the competition. This gives the players a starting chance and practice in developing new skills and endurance for playing the game. Whether it be in Minneapolis, or playing in the streets of Tombstone, Minnesota; the group decides which venue and what equipment that they would most enjoy.